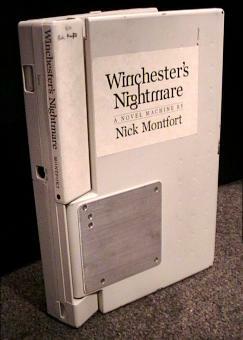 Winchester's Nightmare is available in hardback: a 386 laptop computer, with power adapter, running the interactive text. Ten numbered hardbacks have been manufactured, and some are still available. You can purchase one for $300. That price includes domestic (US) shipping. Email me at nickm.com if you wish to purchase a hardback. My email address is my first name followed by my last initial. Download winchest.z8, the story file. Right-click (or ctrl-click with a one-button Mac mouse) and choose the appropriate option to save the linked file. After you have installed an interpreter, simply drag winchest.z8 onto it, or run the interpreter and open winchest.z8 in it. The softback edition avaiable here contains the complete text of the hardback edition. A description of Winchester's Nightmare is also here online, along with an instruction sheet that has information both for text-adventure veterans and those new to the interface. Release 5 of 31 Jan 2002 contains two significant changes: an option to allow abbreviated commands ("abbr") and an adaptive hint system accessed by typing "hint". Details are on the instruction sheet. I made release 3 available as an executable for Windows (zip, exe) and Mac System 9. The current release is not available in this format. Creating stand-alone executables out of z-code is an elaborate and crufty process, and the result limits the player to using a single bound-in interpreter. Nevertheless, I'll keep these obsolete files in place. As mentioned above, a Web edition of Winchester’s Nightmare is available, too.